ROME — It’s what virtually all of Italy was hoping to see in the World Cup playoff against Sweden: Lorenzo Insigne streaking past the defence to score a decisive goal. It finally happened on Saturday but Insigne was wearing a Napoli shirt instead of the national team kit. Insigne helped the Serie A leader beat AC Milan 2-1 and strengthen the belief of all of the country’s armchair fans. Azzurri supporters were livid with recently fired Italy coach Gian Piero Ventura for under-utilizing Insigne in the 1-0 aggregate loss to Sweden. The speedy winger is considered Italy’s most talented player at the moment, and he showed why again at San Paolo Stadium. 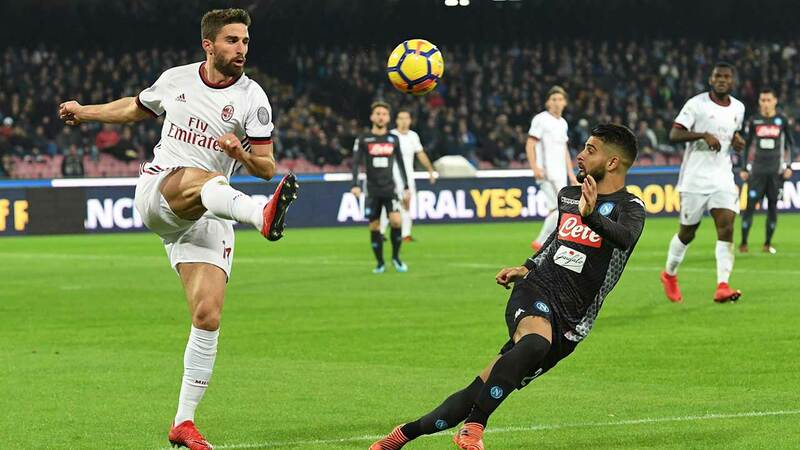 Midfielder Jorginho’s throughball left Insigne with only the goalkeeper to beat and the winger scored with a delightful lob of the charging Gianluigi Donnarumma. The goal was initially waved off for offside but reinstated with help by the video assistant referee. Insigne nearly scored another when he hit the post in first-half added time in another effort flagged for offside. Then in the 73rd, Insigne inspired the play that led to a score for substitute Piotr Zielinski, who shot through Donnarumma’s legs. "I’m more upset for not going to the World Cup than not to have played," Insigne said. "I don’t want to create controversy. I’ve always said that I respect the coach’s decisions. "It’s very upsetting but now I’ve got to think about Napoli." Alessio Romagnoli pulled one back for Milan in stoppage time with a long, bouncing volley. Napoli moved four points clear of six-time defending champion Juventus, which visits Sampdoria on Sunday. "We know this year could be a big year," Insigne said. "We’ve just got to keep our heads down and our feet on the ground and keep working." Milan remained seventh after another dispiriting loss for the off-season’s biggest spender. Milan has as many losses — six — as wins, and has lost to all of its main rivals, including Lazio, Roma, Inter Milan and Juventus. Roma scored twice in four minutes early in the second half to beat Lazio 2-1 in the most high-profile derby between the Italian capital’s clubs in years. After Diego Perotti opened the scoring with a penalty, the Argentine winger turned provider when Radja Nainggolan added another to finish off a swift counterattack. Nainggolan’s status had been in doubt due to injury but he was a surprise starter. Ciro Immobile converted a penalty for Lazio to reduce Roma’s lead and add to his league-best scoring total of 15 in 12 matches. Roma moved into third place while Lazio dropped to fifth, two points behind.